Last week we discussed starting with organizational strategy when creating HR metrics that matter to your organization. That blog received the most feedback, I have ever received since writing Profitability Through Human Capital. I had many requests for a larger version of the strategy map and many questions about definitions that we use when mapping strategy. So, I thought I would do a follow up due to all the feedback. 1) Strategic Goals-An organizational statement that communicates where your organization is going. It is directional. It can be called different names. 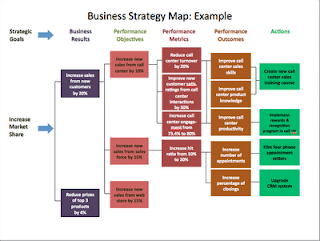 2) Business Results-These are clear directions & measures of success in achieving the strategic goals. 3) Performance Objectives-Think of these as business KPI’s or what needs to be done to achieve the business results. People begin to see what needs to be done & how they can fit in. 4) Performance Metrics-Metrics are designed solely to drive improvement & track progress for the Performance Objectives. They are specific & quantifiable goals. 5) Performance Outcomes-These are definitions of your desired outcomes that force the organization to be clear about what will improve. Also helps people plan specific actions & projects to achieve the goals. 6) Actions-These are the "what" you need to do to execute on the strategy. Let's try and walk through an example. 1) All scenarios are accounted for and identified. 2) Everyone is on the same page and understands the interdependencies between departments. 4) Serves as a strategy execution tool as each department has uncovered what they need to do to move the strategy forward. 5) Uncovers all actions that should be considered and ANALYZED to determine which are the BEST alternatives depending on budgets and AHA's found from data analysis process. This process is critical for strategic execution and it is a perfect exercise for HR to own and manage. HR has been screaming for strategic work....here is your opportunity! Great post. What tool did you use to make the graphic? It looks great. You won't believe this, but it is Powerpoint. We believe in keeping it simple and using the tools you already have....just boxes and arrows.